Clips from the concert were recorded 37 years ago today. Nothing beat Van Halen in their prime. Fueled by electric, animal energy, the band dominated the ‘70s and ‘80s as they cut a raging path across hard rock, shaping the field as we now know it. Back when the band included its original members, Michael Anthony’s booming basslines chugged along each track, and David Lee Roth stomped to the march of a mean drumbeat. Their sound was as big as their overblown hair; a roaring sonic boom to the senses. In 1981, Van Halen took to the Oakland Coliseum Stadium in Oakland, Calif. for a three-night set of shows, performing for sold out crowds of 11,300 fans each night. This footage, recorded on the second night of performances, went on to premiere on MTV as promotion for their recently released album, Fair Warning. 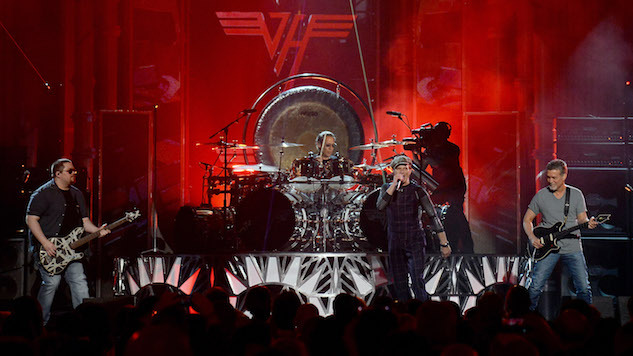 It was the dawn of the music video age: David Lee Roth’s stage antics and glitzy spandex made for the ideal spectacle, especially when coupled with Eddie Van Halen’s wailing guitar heroism. 37 years later, you’ve still got a performance with measured talent and crazed energy that oozes charisma. Watch these clips from the famed concert for yourself below.